This project features the famous New York dj and promoter Rexx Arkana and members of Icon Of Coil, Covenant, VNV Nation and Apoptygma Berzerk. Also features remixes by Melotron, Front 242, Negative Format and more. 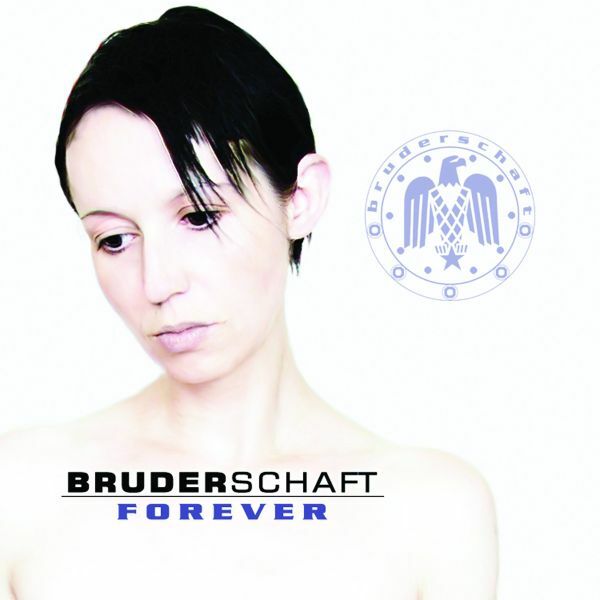 Super-charity group BRUDERSCHAFT strikes back with the full length album "Return"! Just like for the hyper successful "Forever" EP released some 10 years ago, all net profits of this new album will go to various cancer charities for the purposes of research and treatment, and to assist families with loved ones who are suffering from cancer so that they can be there to provide comfort in their time of need. Famous New York DJ and artist Rexx Arkana managed to gather VNV NATION, COVENANT, APOPTYGMA BERZERK and ICON OF COIL members for the "Forever" EP. Similarly the "Return" album adds his FGFC820 partner in crime Drcos as a full-time band member and features a host of powerhouse artists and contributors fueled by the vocal contributions of talented singers from renown bands like ASSEMBLAGE 23, BEBORN BETON, HAUJOBB, AESTHETIC PERFECTION, COLONY 5, SYSTEM SYN, SYRIAN and IEN OBLIQUE. Amongst the musicians / songwriters, besides the original contributors of Joakim Montelius (COVENANT) and Sebastian Komor (ICON OF COIL, ZOMBIE GIRL, KOMOR KOMMANDO) we will also notice the contribution of Daniel Myer (HAUJOBB), Johann Sebastian (STATE OF THE UNION) and Maze (BLANK). "So much has changed in the ten years since this journey began", says Rexx Arkana. "As my father and so many others stricken by cancer have discovered, life doesnt always go according to plan. Neither did this record, but in the end I think we triumphed and the result is worth it. It is my sincerest wish that - someday - we might be able to say the same thing about this horrific deadly disease". While the perfect emotional vocals of Ronan Harris (VNV NATION) and Stephan Groth (APOPTYGMA BERZERK) transformed the debut EP "Forever" into an instant hit and classic future-pop anthem, it was often said back then that the only missing link to this all-star BRUDERSCHAFT gang was Tom Shear's unique voice. "Return" changes this and even revises history by pushing the ASSEMBLAGE 23 singer into the driving seat on the uncontested "Return" but also on the upgraded album version of "Forever". And it's that same magic recipe that triumphantly gets used on every song with each singer perfectly capturing the raw emotions of the lyrics and contributing to the forceful depth of this beautiful album. Whether with Stefan Netschio of BEBORN BETON on the touching "6AM", with Daniel Myer of HAUJOBB for the alluring and intricate "Falling", with Daniel Graves of AESTHETIC PERFECTION for the EBM-pop pearl "Dead Tomorrow" or yet SYRIAN's Andylab's take on THE HUMAN LEAGUE's classic cover "The Things That Dreams Are Made Of"... The honourable cause that the truth and sincerity of their shared feelings and emotions allow our favourite art expression that is electronic music to claim the grandeur of its cause and caressing perfection. While enjoying BRUDERSCHAFT's eloquent "Return", let us all join hands again in this diligent human effort and contribute to this long and so important struggle against that devastating disease that is cancer. Limited carton box with bonus disc featuring the remix work of some 12 bands including MESH, FUNKER VOGT, IMPERATIVE REACTION and EDGE OF DAWN to only cite a few. Super-charity group BRUDERSCHAFT strikes back with the full length album "Return"! Just like for the hyper successful "Forever" EP released some 10 years ago, all net profits of this new album will go to various cancer charities for the purposes of research and treatment, and to assist families with loved ones who are suffering from cancer so that they can be there to provide comfort in their time of need. Famous New York DJ and artist Rexx Arkana managed to gather VNV NATION, COVENANT, APOPTYGMA BERZERK and ICON OF COIL members for the "Forever" EP. Similarly the "Return" album adds his FGFC820 partner in crime Drcos as a full-time band member and features a host of powerhouse artists and contributors fueled by the vocal contributions of talented singers from renown bands like ASSEMBLAGE 23, BEBORN BETON, HAUJOBB, AESTHETIC PERFECTION, COLONY 5, SYSTEM SYN, SYRIAN and IEN OBLIQUE. Amongst the musicians / songwriters, besides the original contributors of Joakim Montelius (COVENANT) and Sebastian Komor (ICON OF COIL, ZOMBIE GIRL, KOMOR KOMMANDO) we will also notice the contribution of Daniel Myer (HAUJOBB), Johann Sebastian (STATE OF THE UNION) and Maze (BLANK). "So much has changed in the ten years since this journey began", says Rexx Arkana. "As my father and so many others stricken by cancer have discovered, life doesnt always go according to plan. Neither did this record, but in the end I think we triumphed and the result is worth it. It is my sincerest wish that - someday - we might be able to say the same thing about this horrific deadly disease". While the perfect emotional vocals of Ronan Harris (VNV NATION) and Stephan Groth (APOPTYGMA BERZERK) transformed the debut EP "Forever" into an instant hit and classic future-pop anthem, it was often said back then that the only missing link to this all-star BRUDERSCHAFT gang was Tom Shear's unique voice. "Return" changes this and even revises history by pushing the ASSEMBLAGE 23 singer into the driving seat on the uncontested "Return" but also on the upgraded album version of "Forever". And it's that same magic recipe that triumphantly gets used on every song with each singer perfectly capturing the raw emotions of the lyrics and contributing to the forceful depth of this beautiful album. Whether with Stefan Netschio of BEBORN BETON on the touching "6AM", with Daniel Myer of HAUJOBB for the alluring and intricate "Falling", with Daniel Graves of AESTHETIC PERFECTION for the EBM-pop pearl "Dead Tomorrow" or yet SYRIAN's Andylab's take on THE HUMAN LEAGUE's classic cover "The Things That Dreams Are Made Of"... The honourable cause that the truth and sincerity of their shared feelings and emotions allow our favourite art expression that is electronic music to claim the grandeur of its cause and caressing perfection. While enjoying BRUDERSCHAFT's eloquent "Return", let us all join hands again in this diligent human effort and contribute to this long and so important struggle against that devastating disease that is cancer.